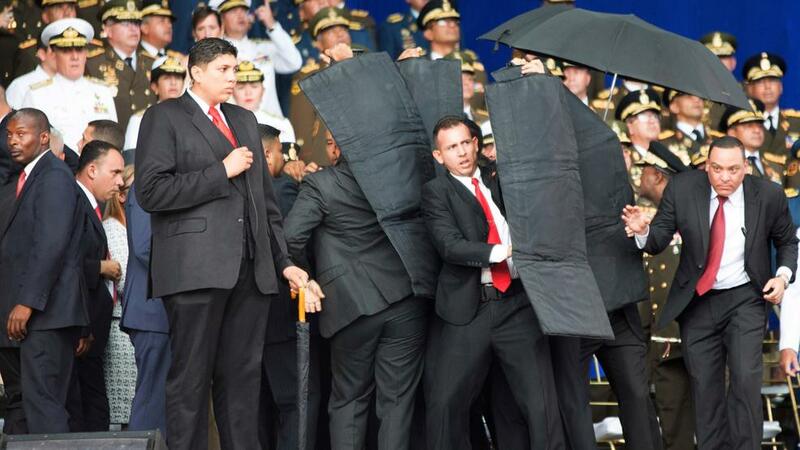 On August 4, 2018, Venezuelan President Nicolás Maduro survived drone-based assassination attempt after several drones armed with explosives flew directly towards him during delivering a speech at a military parade celebrating 81st Anniversary of the Bolivarian National Guard of Venezuela (Guardia Nacional de Venezuela). The assassination was attempted when Maduro was ending his speech — defending his policies as the last economic measures to save Venezuela from impending financial collapse. Kindly do note, the so-called measures were categorically rejected by the country's opposition earlier. The president was unharmed in the incident although seven soldiers in the national guard were injured and several people were arrested, according to the Venezuelan authorities. The government has arrested six people on Sunday (August 5) in connection. The National Flanela Soldiers Movement (Movimento Nacional Soldados de Flanela) — a group that claims to rally opposition forces in the country — claimed responsibility for the attack via Twitter and its report seems to corroborate the official version: "The operation was to fly with two drones loaded with C-4 [a plastic explosive for military use] the presidential stage. Honor guard snipers knocked down the drones before their arrival at the target. We have shown that they are vulnerable. Today we can not, but it's a matter of time." Maduro gave a televised speech following the failed attack in which he blamed the Venezuelan political far right in collaboration with the Colombian far right and the current Colombian President Santos of being behind the assassination attack. Also, the Venezuelan Interior Minister Major General Néstor Luis Reverol Torres reportedly said the arrested "terrorists and hired killers," who are facing maximum punishment, are connected to a group that carried out the attack. Reverol, without evidence, has blamed Colombia for the incident and said that several vehicles were seized and hotels raided. Colombia has called allegations "absurd" and "baseless". The attack on Maduro comes amid the severe economic crisis (being faced by the Venezuelan economy). Despite the fact, the country sits on the largest oil reserves — it is currently facing scarcity of all types of commodities, hyperinflation and poor provisioning of public services. For these reasons, the dozen of protests occurs daily across the country. No matter who was responsible for the apparent assassination attempt, experts say Maduro will use it to justify further concentration of his power.